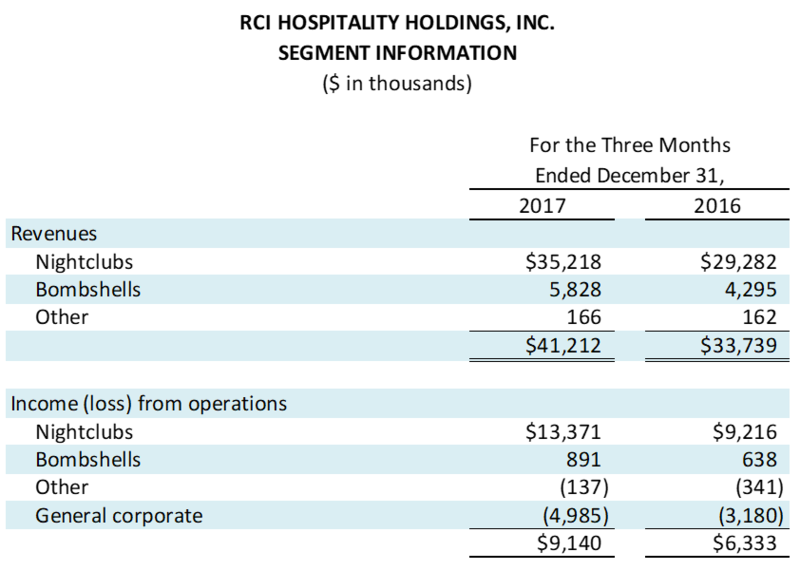 HOUSTON — March 7, 2018 — RCI Hospitality Holdings, Inc. (Nasdaq: RICK) today announced it has filed its 10-Q for the Fiscal 2018 first quarter ended December 31, 2017. The company also announced continued strong core 1Q18 results. "We are pleased to report results and file our 10-Q for the December quarter, making us current in all of our required filings with the SEC," said Eric Langan, President & CEO. "We generated strong first quarter results. Total revenues increased 22.1% year over year due to a 16.0% increase from new units and a 6.9% increase in same-store sales. Non-GAAP operating income rose 44.0% as non-GAAP operating margin expanded 340 basis points. This reflected increased operating leverage and an overall improved portfolio of clubs and restaurants. GAAP EPS increased to $1.47 from $0.30, non-GAAP EPS increased 71.0% to $0.53 from $0.31, and free cash flow grew 47.0% to $7.5 million, keeping us firmly on track with our recently upwardly revised $23 million FY18 FCF target. "Operating income included approximately $500 thousand in additional expenses related to transitioning to our new financial reporting system and working to complete our year-end audit. Interest expense included $827 thousand in debt issuance costs and prepayment penalties related to closing the new bank loan. All of these expenses were more than offset by a $9.7 million reduction of deferred tax liability as a consequence of the new Tax Cuts and Jobs Act. Our non-GAAP calculations exclude the $827 thousand in interest and $9.7 million tax benefit. "Looking ahead, positive revenue trends have continued through 2Q18 to date. As we most recently reported, in January, business was good even with some bad weather. In February, we had good sales related to the pro football championship in multiple markets. In March, major college basketball tournaments in New York City and in Charlotte are expected to benefit our four clubs in those markets. "Our FY18 plan continues to be opening a new Bombshells by the end of the current quarter. This would be the first of three new Bombshells in development in the Houston area. As a result of the Tax Cuts and Jobs Act, for the full year FY18 we anticipate an effective federal tax rate of 24.5% and a total effective tax rate of 26.5%, which includes state and local taxes." Total revenues increased $7.5 million, or 22.1%, as all core revenue lines continued to grow. 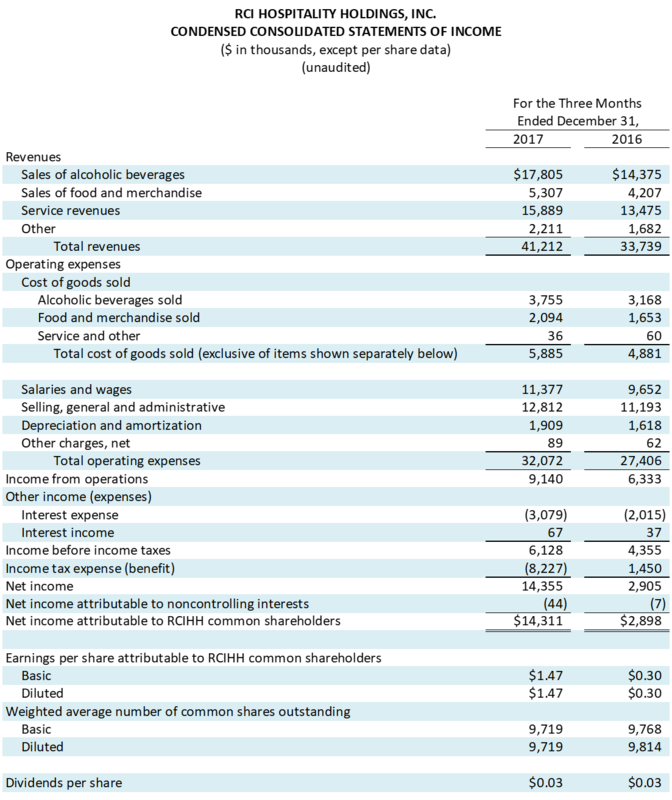 Beverage revenues rose $3.4 million (23.9%), higher margin service revenues $2.4 million (17.9%), and food $1.1 million (26.1%). The second full quarter of Scarlett's Cabaret Miami and Scarlett's Cabaret St. Louis, both acquired in 3Q17, and the first full quarter of our Bombshells Restaurant & Bar on Highway 290 in Houston, which opened 4Q17, altogether added $5.2 million in new revenues. Overall, revenues also benefited from strong marketing related to televised pro baseball, football and mixed martial arts sporting events. In particular, RCI's Bombshells sports bars/restaurants in Texas enjoyed noticeably increased traffic in October with the Houston Astros winning all the way through the playoffs and World Series. Operating income increased 44.3% to $9.1 million (22.2% of revenues) from $6.3 million (18.8%). 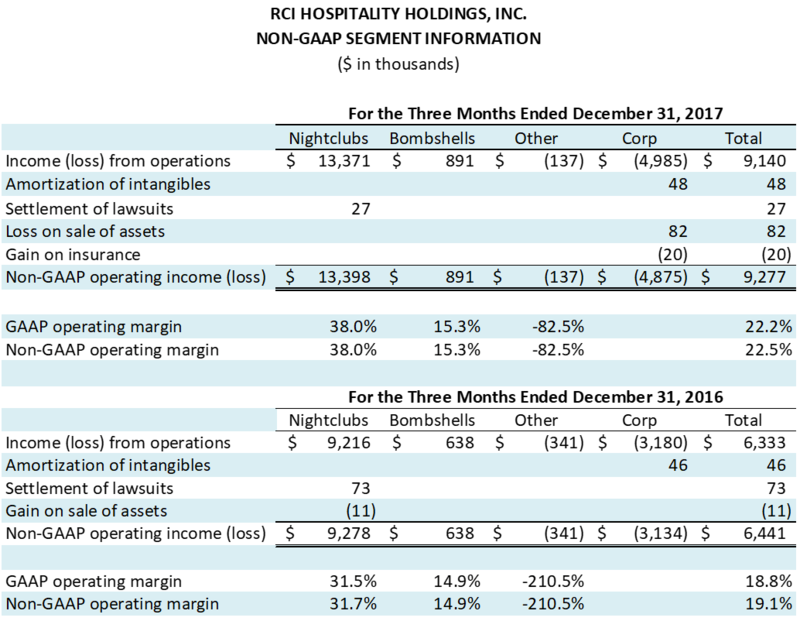 Gross profit margin increased 20 basis points to 85.7% of revenues, reflecting increases in higher margin service and beverage revenues. Operating expenses increased $4.7 million, but as a percent of revenues, declined 341 basis points to 77.8%. On a non-GAAP basis, operating income increased 44.0%, to $9.3 million (22.5%) from $6.4 million (19.1%). Sales increased 20.3% to $35.2 million from $29.3 million, with 40 units compared to 37. Operating income increased 45.1% to $13.4 million (38.0% of sales) from $9.2 million (31.5%). 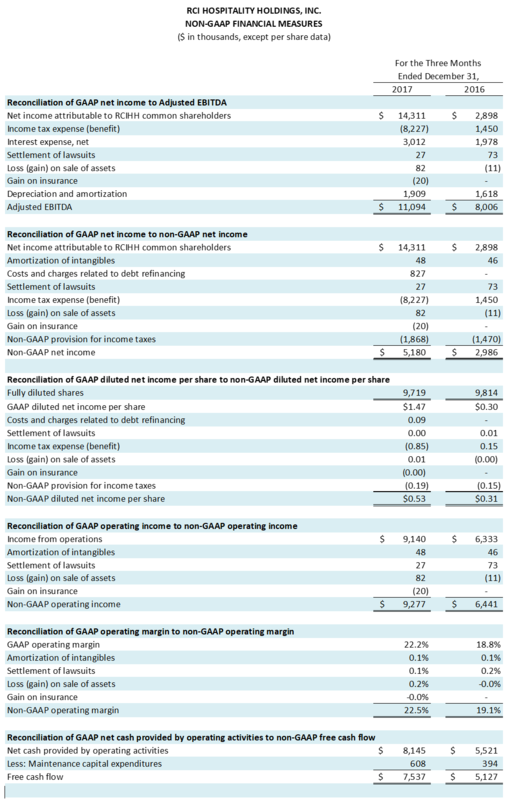 On a non-GAAP basis, operating income increased 44.4% to $13.4 million (38.0%) from $9.3 million (31.7%). Sales increased 35.7% to $5.8 million from $4.3 million, with 5 units compared to 4, reflecting the addition of a larger unit on busy Highway 290 in Houston. Same-store sales increased 5.6% as customers continue to be attracted to our military themed social dining concept with our Bombshells Girls, where you can have a great time and great food, watch the game, listen to music and hang out with friends or family. Operating income increased 39.7% to $0.891 million (15.3% of sales) compared to $0.638 million (14.9%). Cash and cash equivalents increased 20.5% to $12.0 million at December 31, 2017 from $9.9 million at September 30, 2017. Adjusted EBITDA increased 38.6% to $11.1 million—the highest level in the last two years—in 1Q18 from $8.0 million in 1Q17. RCI's FY18 FCF target of $23 million is based on estimated net cash provided by operating activities of approximately $25.5 million, less maintenance capex of approximately $2.5 million. The Effective Tax Rate was 25.4% in 1Q18 excluding the effect of the $9.7 million reduction in deferred tax liability. This compares to 33.3% in 1Q17. Planned opening dates are subject to change due to weather, which could affect construction schedules, and when final municipal inspections can be scheduled.